If animals love non-native trees, why don’t humans? “As a marginalized human, I identify with and feel protective of plants and animals who are feared and hated for no rational reason. I was taught to fear spiders, but when I was eight I realized I couldn’t live in such terror, so decided to change. After observing and learning about spiders, fear turned to love. I’ve handled or petted so many spider species, scorpions, etc. with no problem. Without fear of nature, the entire world opens up. I’ve since had wonderful communication with wild species, from fish to spiders, insects, scorpions, rattlesnakes, raccoons, rats, skunks, and opossums. I’ve also learned to befriend plants like Poison Oak. I’ve heard the propaganda meant to terrify us into hating beautiful exotic trees and plants because they supposedly harm wildlife, cause fires, and degrade ecosystems. Yet I know the harm caused by other myths and I love plants. I appreciate how many species grow in the Bay Area, from botanical gardens and elaborate landscaping to city street trees and simple yards in neighborhoods. The diversity here is amazing. I’ve also noticed that few native trees are well-suited as street trees and in landscaping, while many introduced species are beautiful to see in our semi-tropical area. People have learned that if they want to attract birds, butterflies, etc. they need to plant non-natives, which continue feeding animals throughout the year because there is always something in bloom. On a friend’s street, I was astounded to hear the sound of birds like nothing I’ve heard elsewhere because of a few Australian bottlebrush trees pruned into a lollypop shape, which isn’t attractive, but provides safe homes for countless birds. 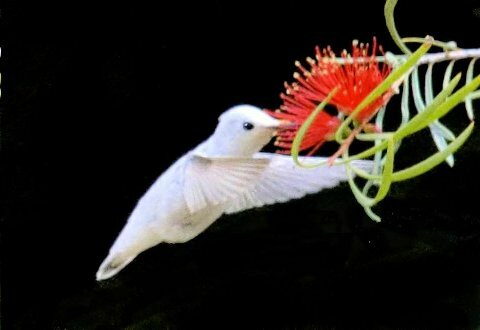 Hummingbirds seem to be increasing as people plant more of these trees, exotic sages, and other plants. 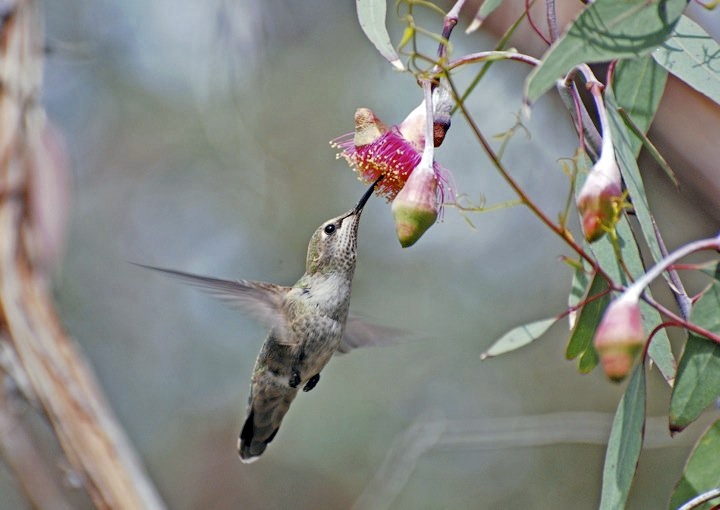 The list of non-native plants that nurture birds in our cities is astounding. And some of these plants are adapting to our environment and native animals. While many of our native trees are dying from human-introduced and caused diseases and insect infestations, we are lucky to live in an area with such plant diversity. Even if all the oaks die from Sudden Oak Death, and conifers die from bark beetle infestation, we still have a wonderful variety of healthy, mature trees which are immune to those diseases and infestations. I recently learned that in the Midwest where I grew up, the ash tree I so loved as a child is being killed by an insect infestation caused by humans. So, combined with other diseases, a large part of the US east of the Mississippi might eventually be treeless. Our plant diversity ensures we will continue to have beautiful trees in the Bay Area – except for the danger from a few humans motivated by an irrational hatred of non-native plants. Even while we are dealing with serious drought, these fanatics want to kill the trees which are the most likely to survive, while other parts of the world are desperate to save the trees they have. The nativists (who, of course, are predominantly non-native) are using xenophobic politics. They are hypocritical because they want to keep their fruit trees, vegetable and herb gardens, and exotic ornamentals as well as their pets and non-native domesticated animals while they demand that wild non-native animals be killed. And of course they won’t remove themselves. Nor are nativists demanding the elimination of California’s extensive agricultural industry that is based on growing non-native species for the rest of the US, nor the non-native honeybees essential for pollination. The myth of fire risk is the con for destroying our parks but nativist ideology is also being used by the East Bay Regional Park District (EBRPD) and UC Berkeley as the rationale for getting millions of dollars in FEMA money to kill at least 400,000 healthy non-native trees and poison our public lands. The Sierra Club has sued to kill even more trees. East Bay Regional Park District (EBRPD) is also hypocritical because they landscape their headquarters with primarily non-native species such as eucalyptus, olive, and Hedera canariensis (ivy). UC Berkeley, whose goal seems to be to turn our forested East Bay hills into highly flammable barren dry grasslands and more construction, has similarly landscaped their entire campus with exotic trees. It’s only the animals that are being deprived of the plants they need for shelter, nesting, and food. One of the myths is that the exotic trees do not help native animals but many animals have adapted to and need eucalyptus. Raptors, like golden eagles, hawks, and great horned owls prefer to nest in Blue Gum eucalyptus because they are very tall trees with an open canopy, safer for young raptors to learn to fly in than the shorter, dense coast live oak and bay laurel forests. I had no idea how vulnerable these raptors were until I read about juvenile peregrine falcons dying from hitting branches as they were learning to fly. It’s easy to think of such graceful birds as having good flight control, but they don’t when young. Even watching California condor adults trying to safely land on cliffs and trees was a revelation because they had to struggle so hard. After seeing red-shouldered hawks nesting in sycamores at Sunol Regional Wilderness, I realized how similar those trees are in appearance to eucalyptus: tall, open, and easy to navigate. But sycamores don’t grow in many places, while eucalyptus can grow anywhere. I’m guessing many of our raptors have expanded their range because of eucalyptus. Even in our relatively barren Oakland urban neighborhood, we see nesting red-shouldered hawks only because of one stand of magnificent eucalyptus. A Quest documentary on KQED interviewed EBRPD’s Wildlife Manager Doug Bell who explained that golden eagles in the Bay Area are declining because they can’t reproduce quickly enough to counter the high numbers killed each year by the wind turbines at Altamont. The film shows golden eagles nesting in eucalyptus, yet nothing was said about EBRPD cutting down eucalyptus. If people care about golden eagles, how can anyone want to kill the tree that most ensures their survival? If more eucalyptus were planted on the many now-barren grassland hillsides, would we be able to stabilize golden eagles’ population? Remember that EBRPD is the same agency that responded in writing to our questions about their toxic pesticide, Garlon, by calling it “Garland.” (Try looking up epidemiological studies on “Garland.”) Garlon is the herbicide that is sprayed on the stumps of eucalyptus trees after they are destroyed to prevent them from resprouting. We have also been told by EBRPD employees that glyphosate is completely safe, even though it’s classified by World Health Organization as a probable human carcinogen. It is banned in many countries and some US cities, and is in our bodies, against our will. EBRPD had recently planned aerial spraying of Briones Regional Park to kill the beautiful little yellow star thistle, which blooms like sunshine on the dry, desolate hillsides in summer. When we objected, they gave us ridiculous reasons, such as helping the boy scouts camp or preventing bicyclists’ tires from being punctured. Why not just stay on the designated trails rather than erode the park and run over animals? When a friend suggested using goats, they actually said it was too steep for goats! EBRPD has temporarily stopped the spraying plan, “for now.” Their massive amount of pesticide spraying next to the bay, reservoirs, and creeks is horrifying and unnecessary. Marin Municipal Water District is able to maintain their enormous open space without using herbicides by mowing or just leaving the plants to die back when the rains stop. Then I was told that they are protecting endangered animals by their spraying. No, they are killing them. I’ve seen a California newt dying a terrible death after crawling through a sprayed area. I’ve seen yellow-billed magpies collecting nesting material from sprayed areas. We can only imagine what other animals are being harmed. We have not heard any rational explanation for spraying poison next to endangered ridgeway rail habitat at Martin Luther King Jr. Shoreline Park. The May-June parks EBRPD newsletter implied their plan to kill trees and spray poison would somehow help the endangered Alameda whipsnake. Nothing we were told by the EBRPD representatives made sense, including that their applicators are well-trained. 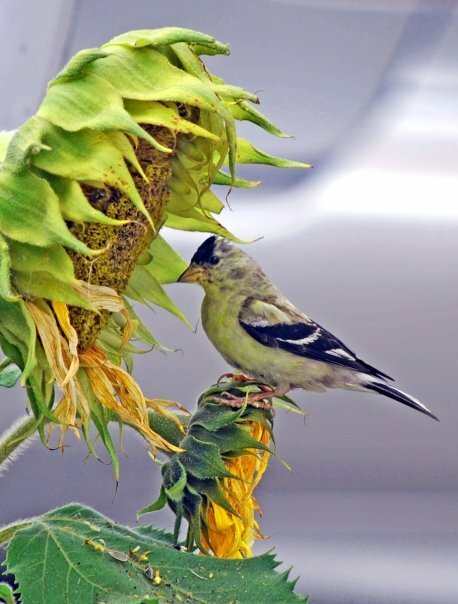 Native Goldfinch with non-native sunflower who provides important seeds for native birds. By Melanie Hoffman. Even plants which are rarely seen and are sold in specialty produce stores, like the beautiful artichoke relative, cardoon (artichoke thistle), with its electric blue flower, are being sprayed, leaving the non-native grasses and poison hemlock to spread. The nativist fanaticism is extreme when tiny forget-me-nots are pulled off fragile steep hillsides, as happened at Huckleberry Botanical Regional Preserve, causing erosion. Do they really think that people prefer seeing enormous swaths of ugly, poisoned earth, as seen at Del Valle Regional Park that had just been lush, velvety green? Why not just let the green go brown naturally as it does every year? They don’t care about the increased fire hazard from the burnt, dry, poisoned plants they leave behind. One of the ironies about the nativists is how little they seem to know. I went on one of their nature hikes at twilight to see the soaproot lily/amole (now in the genus Chlorogalum), because they said it only bloomed at night. Yet soaproot blooms in the daytime all over the Bay Area and I could show it to anyone, any time. The only other mass of wildflowers in that dry, brown hillside, were edible wild mustard, which these nativist “naturalists” called “trash.” On another paid wildflower hike to a preserve, the nativist kept belaboring which species were terrible because they are non-native (like the “expert” herself), and misnamed several of the species we were there to see. This land is now a heavily grazed pasture, so we’re lucky to see any flowers at all. These are some of the experiences I’ve had with nativists. I wouldn’t care that they know so little about plants except that they are wielding the power to destroy the trees, wildflowers, animals, and entire ecosystems that we love and should be caring for. Once our beautiful forests are destroyed, the wildlife will die from hunger and loss of habitat and we will be left with flammable, ugly hillsides covered in poisoned stumps. We should nurture and love rather than kill the exotic plants we are lucky to have. They provide cleaner air and offset global warming. They are doing so much for so many species, including us. Here where I live, biologists and horticulturists have joined together to create a state-wide invasive plants task force. Besides our greatest plague of Lonicera maackii, monocultures of which are choking out a next generation of trees across half the state and spreading, the groundcover euonymus fortuneii is densely infesting natural areas, obliterating colonies of beautiful native spring ephemeral wildflowers. I myself saw it happening to a colony of Trout Lily in a nearby park, excerably swallowed up by ubiquitous euonymus and now gone without a trace. With euonymus filling in so many lowland areas, it is heartbreaking to imagine how much diversity has been lost, including host plants butterfly larvae depend on. Everyone wonders why butterflies have become so uncommon. All too few understand the butterfly/native host plant relationship goes beyond Monarchs/milkweed. Perhaps the worst up-and-comer is Bradford Pears, the darling of subdivision builders, now popping up across prairies, meadows, woodlands, roadsides, etc. The frightful thing…..these extremely invasive non-natives are still legal to sell! The task force and our esteemed botanical garden are working hard to identify plants/trees with invasive potential, to educate the public and nurseries, to encourage volunteers and homeowners to eradicate them. You have to wonder, why would anyone who knows better plant, sell or harbor plants proven to escape cultivation and create destructive monocultures? Certainly, the nurseries should be more responsible about what they sell, but like everything else, including the poisoning and clear-cutting of our wilderness lands and parks, it’s all about money. The plants I see most complained about, such as non-native grasses and Italian thistle and Poison Hemlock, disappear when the trees return. They can’t take shade. So let the trees grow and spread. The only serious problem that I’ve seen in over 40 years of gardening is ivy, especially species Hedera Canariensis since it grows in all conditions and can completely cover and kill the tallest trees. It’s easy enough to stop by cutting at the base of the tree with loppers. Even though the seeds are dropped by birds, I don’t see it spreading in our parks or open spaces. There is no reason ever to use poisons. Not worth one more human or animal death. As even our poorest Bay Area neighborhoods have increasing trees and beautiful flowering ornamentals from all over the worlds, the butterflies and birds are also increasing. We would not have anywhere near this diversity with only native plants. The birds and other wild animals teach us that. I have said before, and I must say again that ivy is not capable of killing tall trees. This is not my own opinion. It is the opinion of several professional and academic arborists who cite empirical studies supporting their opinion. When trees die for other reasons and begin to lean, ivy is capable of over-topping them, creating the mistaken impressions regarding cause and effect. Otherwise, I obviously agree with you about everything else you say. Ivy, vinca, euonymus and other dense non-native groundcovers are planted by property owners to create monocultures that discourage other unwanted growth, including tree seedlings. It should come as no surprise then that when these invasives escape cultivation, they suppress growth of seedling trees in parks and nature areas as well. Bird and butterfly diversity is NOT increasing where I live, and from what I hear, most places in the country. You would have a very hard case arguing that invasive, non-native vegetation has done more good than harm. Not true. And all anyone would have to do is google search “invasive species” to find that habitat loss due to invasive species is confirmed science accepted by the Environmental Protection Agency, US Dept. of Agriculture, US Dept. of the Interior, US Fish and Wildlife Service, US Bureau of Land Management, National Park Service, National Wildlife Federation, Sierra Club, Audubon Society, Earthjustice, Environmental Defense Fund, Greenpeace, etc etc etc…….as well as the United Nations. It is true that the conventional wisdom for over 50 years has been that native plants are superior to non-native plants and that non-native plants are harmful to ecosystems. However, in the past 15-20 years, many empirical studies have tested that hypothesis and found no evidence that it is actually true. That is, when you try to find evidence that non-native plants have harmed native plants or animals, no such evidence has been found. Nor has it been possible to find evidence that non-native plants have reduced biodiversity of either plants or animals. There are hundreds of studies that have tried to find such evidence and have been unable to do so. It takes a long time to reverse a deeply embedded belief about the superiority of native plants for many reasons. Cultural lag predicts that it will take a new generation of scientists to train a new generation of undergraduates based on the empirical evidence that they find on the ground. And the “restoration” industry now has a great deal of economic interest vested in the futile efforts to eradicate non-native species. The manufacturers of pesticides are also promoters of invasion biology. The study you mention by Linda Chalker-Scott, “Nonnative, Noninvasive Woody Species Can Enhance Urban Landscape Biodiversity,” is irrelevant to your point, as it says right there in the title that it regards “non-invasive” species. Non-invasive exotic species are not the issue in habitat destruction. Furthermore, you mention “economic interests” promoting a “restoration industry”…….please give examples of these profitable opportunities! Cause everybody I work with is a volunteer and even biology professionals don’t make a big salary. Really, it’s like saying climatologists invented global warming as a make-work scheme. And Monsanto could care less about habitat restoration. They don’t even get rid of the invasive exotic Lonicera maackii on their own world headquarters campus! You need to read the entire study, not just the title before you dismiss it. The quoted conclusion applies to all non-native plants. Furthermore, the term “invasive” is a slippery slope. It is over used and it is strictly a matter of opinion. The main target for eradication here in California is eucalyptus. Its “invasiveness” is rated as limited by the California Invasive Plant Council. In fact, it is rarely invasive. Native coyote brush is much more invasive than eucalyptus. Coyote brush has invaded native grasslands and is destroyed just as often as many non-native plants. As for “economic interests,” here are just two expensive projects here in the Bay Area. San Francisco’s so-called “Natural Areas Program” spent over $22 Million from 1997 to 2014 attempting to eradicate non-native plants and establish native plant gardens. The FEMA grants that will fund the destruction of over 400,000 non-native trees in the East Bay have provided over $6 Million dollars to the three land owners and those land owners must put up several million dollars of matching funds. 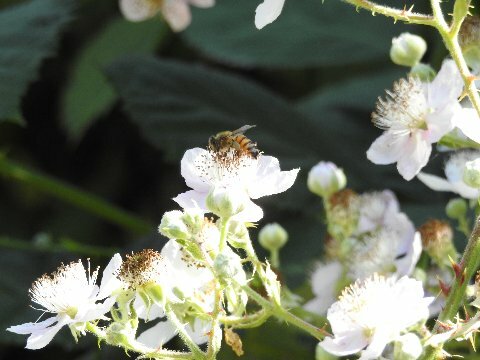 The manufacturers of pesticides contribute money to the various organizations that promote the eradication of non-native plants, such as the California Invasive Plant Council and the California Native Plant Society. The manufacturers of pesticides are also represented on the National Invasive Species Council. There are many other examples of collaboration between the pesticide industry and the “restoration” industry. Their motivation for doing so is economic. The fact that they plant non-natives in their gardens is more evidence that their motivation is economic, not ideological. I don’t know how to respond when there is no Reply button on the end of posts. But, here goes…..
First of all, nobody, including Monsanto, actually plants Lonicera maackii. It springs up everywhere on its own. That’s why it’s called a non-native “invasive.” It pops up in parks, it pops up in peoples’ lawns, it pops up between cracks in sidewalks. It lines highways, covers hillsides, and still marching on. One might think Monsanto, where they could presumably get free RoundUp, would get rid of it on their campus, if only as promotion of their product. But no! I haven’t seen them promote habitat restoration projects through any government agencies or organizations. And I know people who work for and with all of the above. I don’t know of any habitat restoration project around here with a price tag anywhere near $22 million. They’re all volunteer dependent. If only there was that kind of financial support maybe we wouldn’t be losing our forests. Within 30 years the public will be yelping about how there are no more oaks and hickories, our beautiful forests gone….well, we’ve been trying to warn them. What’s needed is a million dollar media campaign…….so why doesn’t Monsanto finance that? I don’t know what your “restoration” resources are there and you obviously don’t know what they are here. You may not have observed Monsanto promoting the eradication of non-native plants with herbicides, but the public record is very clear on that point. An employee of Monsanto was on the original Board of Directors of the California Invasive Plant Council. He helped to create that organization. You can look at the list of donors to the conferences of the organizations that promote the eradication of non-native plants to see the contributions made by Monsanto and other manufacturers of pesticides, such as Dow. You can look at the list of members of the National Council on Invasive Species to see that there are employees of pesticide manufacturers on it. I am DONE responding to your comments. You repeat the same things ad nauseam and most of what you say is irrelevant to the ecology of California. Please go pull your weeds. Where I live in Oakland, it used to be a wasteland with dry lawns and juniper shubs and almost no trees or flowering plants at all other than a few suffering rose bushes, agapanthus, etc. Now there are still not enough trees, but it’s become popular to plant all kinds of ornamentals from around the world and the animals have dramatically increased. In the last fifty and more years, the number of birds, butterflies, etc. we see is phenomenal. We don’t need experts to tell us that they are not here. No plants, no animals. Our tiny parking strip alone with lantana now attracts many species of butterflies plus hummingbirds when there was nothing before. Red Shouldered Hawks in the city? Only because of the small stand of Eucalyptus. We can see this all over the Bay Area. I’m not too impressed with academics or professionals. Too many times when I’ve asked some about specific animals or plants, I knew more than they did. I know the difference between a leaning or fallen dead tree and a live very tall tree that is increasingly covered in Hedera Canariensis (Algerian Ivy.) Unless someone has been watching that tree over years and even decades, it can be easy to think it was dead when the ivy started. But we can still see tall living trees being covered. At the point where they have no more access to sunlight, plus the weight of years of ivy, they do die. We can see how this happens on the redwoods along Hwy 13, which are still standing and alive, but not for much longer. I’ve pleaded with Caltrans to just cut the ivy at the base of the tree but they either say the dead ivy won’t look nice (better than a very tall dead redwood) or they don’t have time. (By the way, they don’t deny that ivy kills trees.) It’s been over 30 years since I first started calling and they have gotten millions of dollars to kill trees nearby and then use the subsequent erosion as an excuse to cut down more trees for yet more money, bulldozing the hillside where the trees were and putting up ugly walls. They have quite the circle game going. There are a lot of places, particularly along freeways, where we can see ivy completely covering tall living trees. 580 in Oakland is another one. For those who don’t recognize the trees under the ivy when driving freeway speeds, in the spring, the few remaining plums still alive are easier to see when blooming white or pink. I can take whoever is interested on a tour and to show you the specific areas in all stages, from where the ivy is beginning to cover healthy trees to where the trees are clearly suffering, and finally where the tree is completely covered. Even then, they can stay alive a long while before they begin to lean and topple. Hedera Canariensis can similarly completely cover and destroy unmaintained buildings. Ivy is not the real problem. It can be kept under control. Caltrans and other agencies are the problem when they ignore basic plant maintenance while spending money cutting down trees and poisoning roadsides for no rational reason. This article has very little in the way of substance, nothing for facts, heaps of subjective speculation. While invasives, like climate change, are largely unstoppable, and there are no doubt benefits in a mixed bag of consequences, this rose-colored glasses approach, based on no more than the author’s feelings and assumptions about the matter, is worthless. 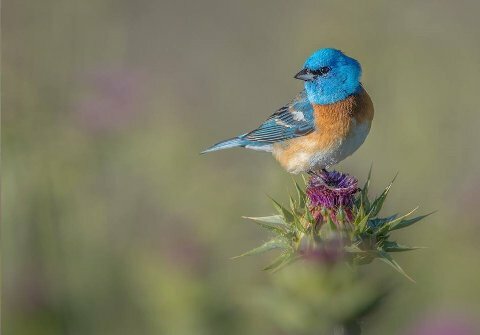 Million Trees usually confines its articles to reporting empirical scientific studies about the many benefits of non-native plants, particularly to wildlife. In response, we receive comments such as this that claim otherwise based entirely on personal experience without reference to any scientific evidence. In the case of this article, we have published the observations of someone who walks in our public open spaces. In response, native plant advocates complain about the subjective nature of the report. In other words, it does not matter how we make the case for non-native plants. Native plant advocates will find a way to attack our arguments whether they are based on personal experience or scientific evidence. So, for the record we will say that Million Trees was not created to change the minds of native plant advocates. We think that is not possible. We are speaking to the majority of people who have not yet formed an opinion on the issue of “invasive” species. People are selfish and don’t want to hear the truth if it doesn’t comply with their personal benefits. Lonicera maackii is a highly invasive Mongolian shrub destroying forests across the midwest, but people still harbor it as a “privacy fence” even as volunteers and other property owners work countless hours trying to get rid of its offspring. Clematis terniflora pops up all along my creek, on both park and private properties, blanketing and suffocating saplings. It can’t be pulled and laughs at herbicides. Every year I chop away at it, but can I charge gardeners who harbor this extremely invasive flowering vine for my time and labor? No. There oughta be laws. If you littered or vandalized the property of others, you would be charged. So if people want to harbor a known invasive exotic on their own property, fine, but once it crosses the property line, whether by seed or root, they should be held liable for cleaning up the properties of those who don’t want it, didn’t ask for it, and shouldn’t have to deal with it. I derive no “personal benefits” from defending non-native plants from being pointlessly destroyed or objecting to public lands being poisoned with herbicides. Not only that, but you are helping all of us, the animals, trees, nature, the earth itself. And with no compensation. Can’t get more selfish than that. We all owe you so much, Milliontrees. Now there are still not enough trees, but it’s become popular to plant all kinds of ornamentals from around the world and the animals have dramatically increased. In the last fifty and more years, the number of birds, butterflies, etc. we see is phenomenal. We don’t need experts to tell what that they are not there. I can take whoever is interested on a tour and to show you the specific areas in all stages, from where the ivy is beginning to cover healthy trees to where the trees are clearly suffering, and finally where the tree is completely covered. Even then, they can stay alive a long while before the begin to lean and topple. Hedera Canariensis can similarly completely cover and destroy unmaintained buildings. Those who can’t disagree on the substance of the issues quickly resort to insults and name-calling. “Worthless” says more about “toadflax” than my article. I wonder if he kills the non-native toadflax he sees. If anyone is not facing facts, it’s is those who believe the propaganda that we should kill beautiful non-native trees even while our native trees are dying, and even though the trees that the native animals love, need and use, are no danger at all in regards to fire. As we can see from daily California news, the fires are starting in grasslands, while we have had none in our urban forests. But this wonderful blog has already answered everything. About Creekgirl, I can sympathize with being intruded on by neighbors, which happens not just with plants. That is part of the problem of living in an over-populated world. But in cities, the alternative to having plants you don’t like is too often burnt, dried out cracked earth covered in pesticides or concrete. That is primarily what we see in the poorest areas, where the landlords just spray the earth and nothing ever grows. At least the plants you hate provide oxygen, lower the temperature, and help with global warming. I think it’s also worth reminding here in this thread that the San Francisco Bay area is now home to 7 million people and their cars and their homes. This is not a rural area that needs to be returned to its pristine condition. There is a rich architectural history in the East Bay Hills which grew alongside and concurrent to the mixed eucalyptus forest. The trees and houses were designed together, if you like. But on a more practical level, today we need every tree we can get. To cut down healthy trees goes completely against the Paris climate record of last year, and we East bay dwellers have always known, that a tree covered hillside is much less likely to erode and cause landslides when we get our rain. Our energy usage is reduced in the summer by the shade our trees provide! There are simply so many more advantages to keeping our trees then there are to cutting them and treating the stumps with poison. I really feel that the clearcutting proponents are not only blinded by money issues and acquisitiveness, but have deep problems in that they are attempting to fix what is not broken, and not fixing what is broken in the East Bay. as well as creating political capital by being perceived as job creators with the FEMA money that the city of Oakland was granted. The city of Oakland government appears to be asleep at the wheel. And UC Berkeley is a megalomaniac. And East Bay regional Park District is, well, just not very bright. Garland, indeed. This is a beautiful article, Bev Jo. Thank you so much, Julie!!! You described that so well. It’s painful to be in the beautiful Bay Area and see so much need for funding like from FEMA that could truly help people instead of destroying our parks and poisoning our air, water and earth. We are so lucky to have such beauty and diversity here. Unless stopped, this will be one of those avoidable disasters that in the future people will ask why this was allowed to happen. Money is the answer, but no excuse. Fascinating post and has certainly created a discussion. Some invasive plants are cleared in the UK. Himalayan balsam clogs up riverbanks and does seem to prevent some species flourishing. However, I Agree if there are ecosystems which use non native then a lot more thought is needed. Gradual and specific areas can help like with the British red squirrel in certain protected areas whereas the grey one is everywhere else! Thank you. Interesting plan about the about the squirrels in Britain. Here, the stunning Fox Squirrel gets blamed for taking territory, when in reality they just do better around cities and humans and pets, being larger and bolder, and they actually make close friends with people and come inside our houses. (I’m crazy about my squirrel friend.) There is a different species in San Francisco in the Arboretum, but I’m guessing that’s because it’s a protected and fenced area with no predators. Here, the attitude is kill without thinking, like with the Barred Owls in Muir Woods, who they think are replacing the Spotted Owls. Again, it seems to be that the Spotted can’t deal with noise and humans. But the two species are almost impossible to tell apart (I’ve luckily seen both) and both are breathtaking to see since they are so different from other owls. (The Spotted were two young ones who hissed at me for looking at them. The Barred was right in the middle of where the loud tourists were, seemingly unbothered.) I hope they leave the Barred Owls alone. Who has even seen one? Sorry for delay in replying. There does seem to be quite an issue in the States about invasive species and hope there is a sensible and compassionate way forward.